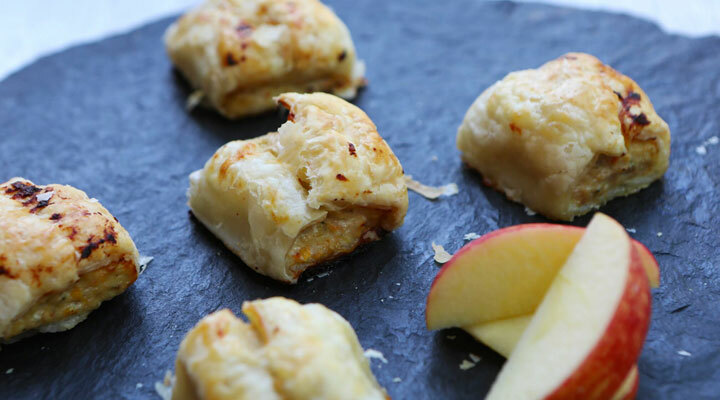 Great finger food for the whole family and can be baked from fresh or frozen for a quick and tasty treat. Preheat the oven to 180 C. Line a baking tray with grease proof paper. Remove the pastry from the freezer and set aside to soften. Meanwhile prepare the applesauce. Peel, core and chop 2 small apples and add to a pot with 100ml water. Bring to the boil, reduce heat and simmer for 5 minutes. Once softened, remove from heat. Blitz until smooth, about 30 seconds, adding more water as required. Set aside. Place all ingredients except the pastry and egg into a food processor. Blend on high speed for 20 seconds, until combined. Prepare the pastry by rolling it out. Cut length ways into two rectangular strips. Using a spatula, scoop out half of the minced mixture. Arrange into a sausage shape in the middle of one of the pastry strips. Make sure it is not too large to ensure it will cook through. Roll the pastry around the meat to form a sausage roll, sealing the edges using a fork. Repeat with the other half of the pastry. Cut each roll into 8 mini rolls. If planning on freezing, do so now. Brush with the beaten egg and bake for 25 minutes until golden, crispy and cooked through.